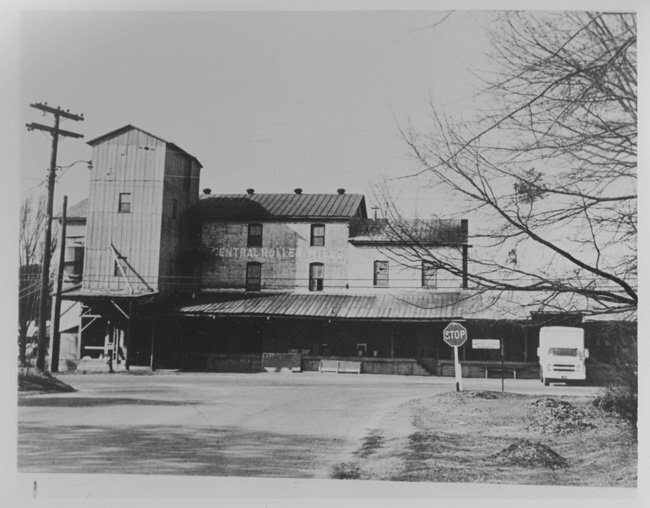 The historical photo below shows Central Roller Mills, a cornmeal and flour mill established in Pickens County during the turn of the twentieth century. 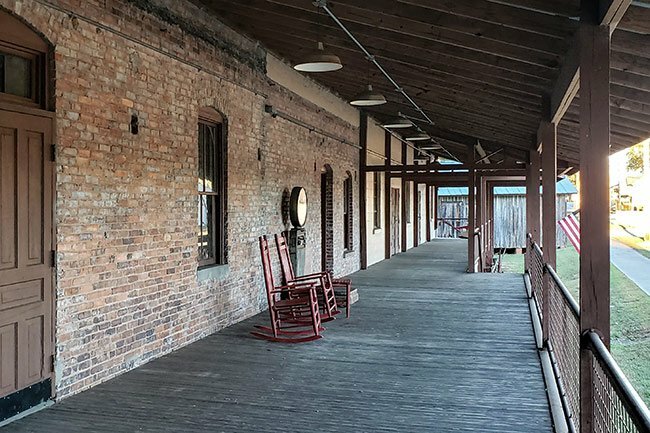 The mill was originally a complex consisting of a three-story building connected to a one-story building. 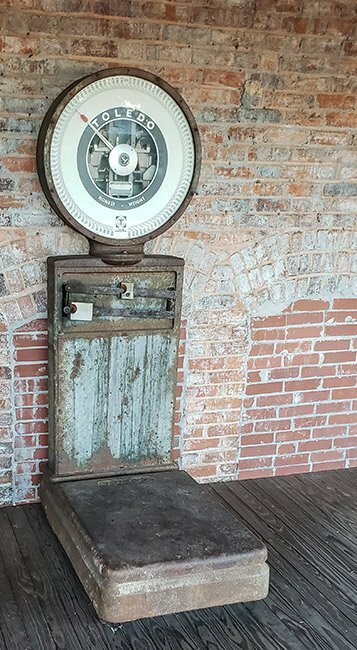 It operated with periods of inactivity until it was purchased by the Pendleton Oil Mill in 1934. Under the ownership of Pendleton Oil Mill, around 1938, a second story was added to the single-story building and another one-story building was added to the site, likely to handle sales. 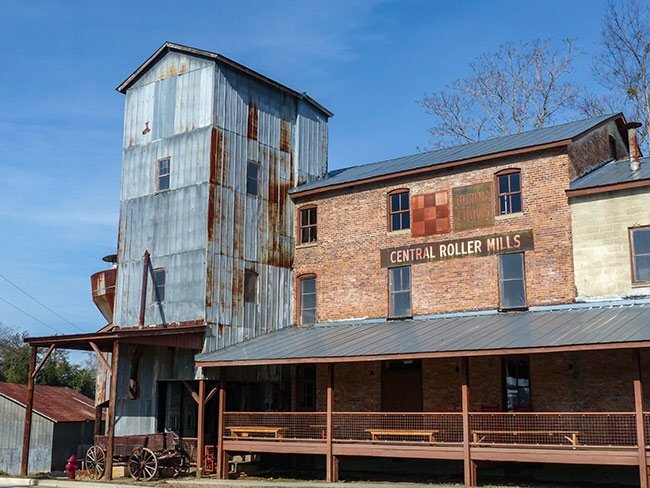 Other additions to the mill during this era included a wooden tower for incoming grain built in front of the complex with nine silos standing behind the complex for grain storage. These rear silos towered 30 feet in the air and were made of rough-cut stacked lumber. Ten more metal silos were built on the complex, along with two concrete silos. Together, the silos were able to store 80,000 bushels of grain. Covered walkways connected all of the silos and buildings. Flour was milled in the three-story building while corn meal was ground in the two-story building. Feed was milled in the two-story building as well as the one-story addition. 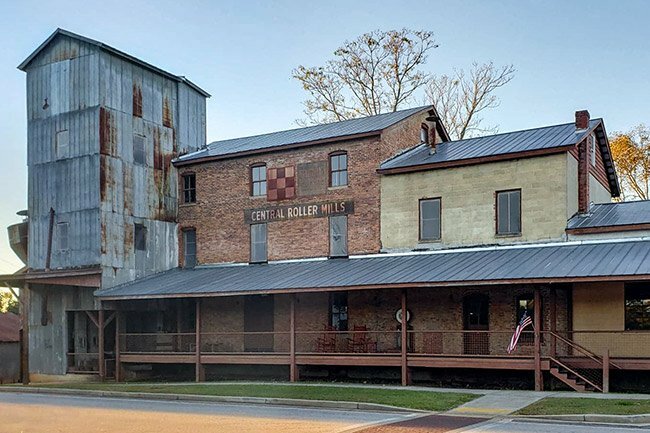 During its peak production, the mill was able to grind 100 barrels of flour, 5,000 pounds of corn meal, and 15 tons of feed a day. The mill fostered an economic boon in Central, and local schools, which made bread on site, were among its best customers. The mill operated until the 1980s, closing after schools stopped making their own bread. The building then housed an antiques store until 2004. Since then it has stood vacant. The mill produced Issaqueena Flour, which depicts the young Native American woman of local lore, Issaqueena, on its logo. According to the legend, Issaqueena traveled on horseback to warn European settlers of an impending attack by her tribe. Nearby Issaqueena Falls, where she is said to have hidden from her tribe members, are also named in her honor. 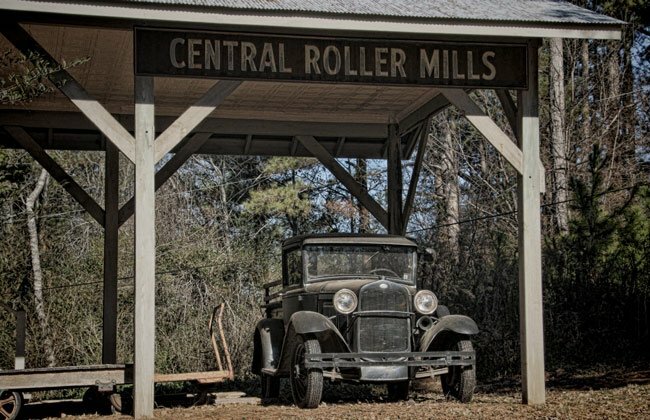 In 2008 the entity Issaqueena Mills, LLC purchased the Central Roller Mills facility and hopes to restore it for limited production and event space. 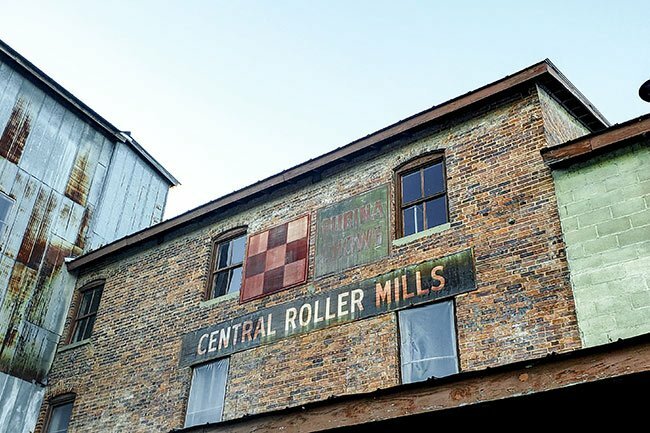 Organized and constructed in 1903, the original Central Roller Mills property was a three-story brick building with a one-story wing on the right side. By 1938, the mill had expanded to include many new buildings and additions. The mill acted as a food supply for the town and surrounding area, supplying local schools with flour for bread. 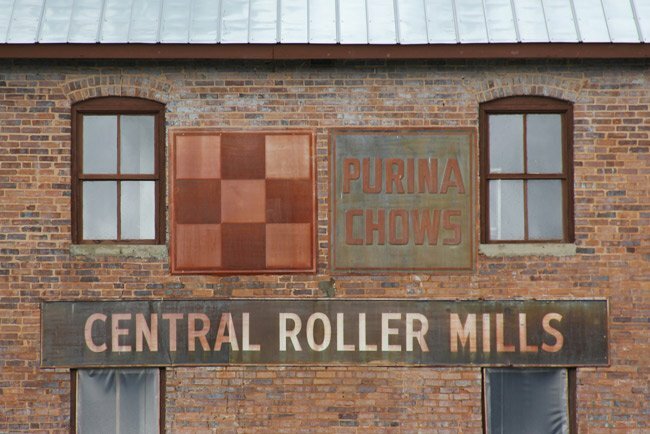 Central Roller Mills ceased operation in the early 1980s. 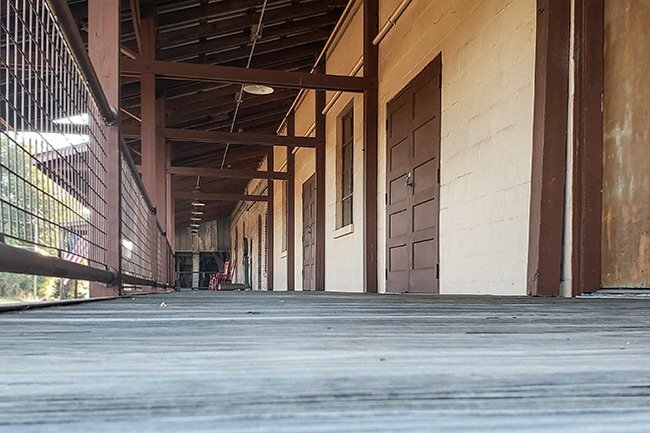 Currently, the property is comprised of three connecting buildings, four stand-alone buildings, 14 exterior silos, and a storage tank.